Monday, the final day of Fudcon came early as usual. 🙂 I had a nice breakfast in the hotel and chatted with serveral Fedora folks, then headed off to the Venue. We were in the student union building with a number of rooms on the second floor. We did a bit of waiting on various people, and setting up laptops and work areas, then started back in on the Fedora Governance hackfest. We didn’t get too far into that before I slipped out to meet up with Jesse Keating and other Rel-Eng folks to go over processes on restarting signing servers and other updates tasks. I slipped back into the Governance talk after that, but it wasn’t long until we decided to just break for lunch and see about presenting what we had so far as a ‘Here is what we have now, how can we make it better’ type document. Lunch was Pizza in the food court. Man was it busy there, we had a search for a table to accomodate our group. In true Fedora community, some of us got a table, someone stepped up to order and get drinks and Jared ordered and brought us pizzas. Move conversation over lunch on Governance, Infrastructure and other Fedora topics. I have noticed a flurry of activity in the last few days from some folks, which is great to see. Gather ideas and energy at Fudcon and then move on to conquer the world. 😉 I’d like to thank Robin and Jared and all the other folks that helped organize this Fudcon, it’s a daunting task, but very much appreciated. This time sadly was different. I ordered a new one, got it in just fine and decided that yesterday was the day to finally replace it. (The laptop was sounding really quite bad as the old fan would spin up, down, up, down, sputter, quit, start again, etc). I expected to take about 30min or so and would have the new fan in place. Disassembly was easy and very much like I recall from the last time I did this. Remove the keyboard, remove the housing around the touchpad/fingerprint reader, and there is the fan/heatsink. 3 screws and it should just pull right out. Not this time. 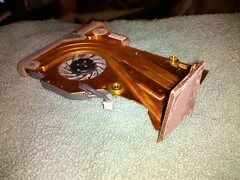 The pink heatsink pad over the GPU would not come off , no matter how hard I tried. Finally I took apart more of the machine so I could remove the other end of it (normally it comes off the GPU first and slides out that side), and pried with the entire rest of the heatsink. Still no luck. So, I took a small screwdriver and a hammer and (trying to be careful) chiseled at it from each side. Finally, I got it to move on one side, stuck a screwdriver into that and chiseled with another some more. Finally that did it and the gpu was free. About 2 minutes later the laptop was reassembled and working normally. There has recently been a bit of noise in the Fedora community around the general “feel” and direction of the community. Some folks are unhappy with some things and are voicing their displeasure. I thought I would collect a few links I found of note recently and my thoughts in general on this. If you run into a problem, try and propose a solution. If you don’t have enough info to propose a solution, how about gathering information for others to allow them to look for solution? Something? Anything? Be kind and appreciative, avoid negative. Toward that end, I am going to try and praise people who propose or implement fixes or solutions and not worry as much about the people who are not. Removing barriers is a good thing. I’d like to see more parts of Fedora have “easyfix” lists or other things that can get people easily involved. Now to get to the subject of this post: I think Carrots are much better than Sticks. Surely in open source communities. A reward for fixing/doing something (even if it’s only a “great job”) is much better and more productive than a “I hate this” or a “I don’t like the way things are going here”. Enough of the negative (stick) and people will stop listening to you or leave, but with more positive (carrot) others, including yourself will get more done and have a more fun time of things. So, if you find yourself trying to get something done in Fedora and can’t get there due to too many people waving sticks at you, feel free to drop me a line and I will try and assist you into reaching for and grabbing that carrot (or at least pointing you in the right direction). Just a heads up that there will be a Fedora Xfce test day tomorrow! See: https://fedoraproject.org/wiki/Test_Day:2011-02-17_Xfce for more information and instructions. It should be pretty easy to download a live image and test it out for us. Help make Xfce 4.8 in Fedora 15 great!